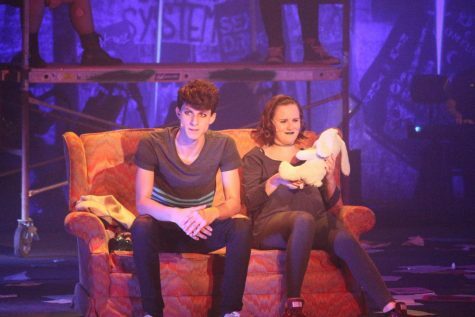 MOON TOWNSHIP – RMU Colonial Theatre is bringing the punk rock scene to life around campus this weekend with their performance of Green Day’s “American Idiot.” Offering great music and phenomenal acting, this musical is one you definitely won’t want to miss. This run of “American Idiot” is being directed by Jeremy Czarniak, Associate Director of Theater Operations at the Strand Theater. 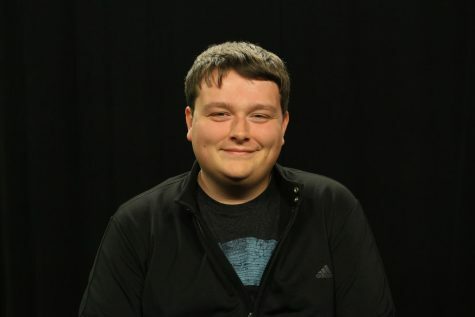 Previously a professor at Robert Morris University and Point Park University, Czarniak is the second ever guest director to work with the RMU Colonial Theater. 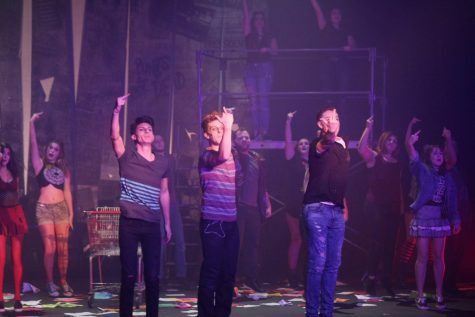 Johnny (Ian Olson), Will (Palmer Masciola) and Tunney (Tanner Yake) join the ensemble in giving the crowd the middle finger. November 7, 2018. 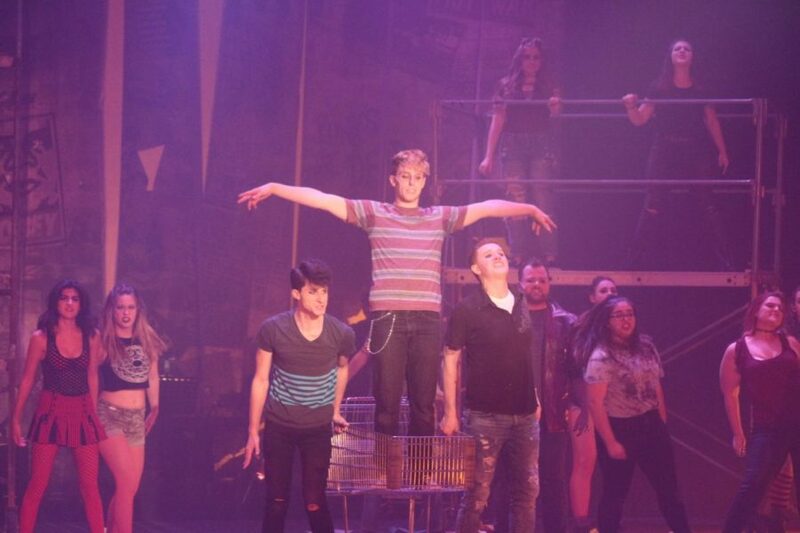 Based on the rock opera of the same name, “American Idiot” focuses on three characters: Tunny (played by Tanner Yake), who ends up fighting for the U.S. military, Johnny (Ian C. Olson), who dives into the dangers of drugs, and Will (Palmer Masciola), who struggles with the pressures of being a young parent. Showing each characters’ personal struggles, the musical shows each characters journey through life. The story takes time to show how the main characters share some of the same fears and concerns, despite the different paths their lives took. Johnny (Ian Olson) and St. Jimmy (Josh Herrera) interacting on stage. November 7, 2018. While every member of the cast does a phenomenal job of making the stage come to life, Olson’s portrayal of Johnny is exceptional at conveying the emotions and struggles that the character faces. From the minute facial expressions and erratic behavior, every scene that Olson is in is a joy to watch. 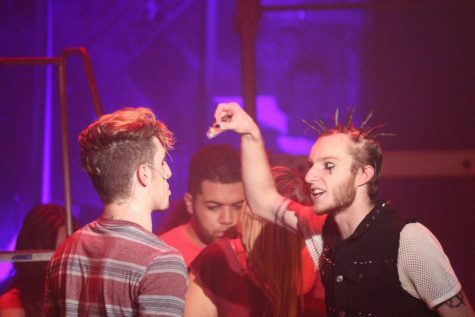 Additionally, his interactions with St. Jimmy (Josh Herrera) are a highlight of the musical, offering great musical performances and excellent acting from both Herrera and Olson. Whatshername (Carly Phillips) breaking up with Johnny (Ian Olson). November 7, 2018. Another stand out performance comes from Carly Philips as Whatshername. Clearly not afraid to get into character, Philips consistently shows in depth emotions and a “rock and roll” attitude. An impressive display of acting, every scene featuring her is emotional, energetic and well choreographed. Will (Palmer Masciola) and Heather (Sarah Beth Smith) on stage. November 7, 2018. The ensemble of American Idiot is equally as impressive as the main characters. Offering an interesting background, as well as lending plenty of energy to the scenes, the entire cast clearly put a lot of time and effort into making each scene memorable. Keeping in tune with the music and bringing the energy of a mosh pit, the musical wouldn’t be the same without their incredible performance. Tickets for “American Idiot” will be available at the door for $10, or at a discounted rate of $5 when purchased from Student Life. There will be a show on Friday and Saturday at 7:30 p.m., as well as a Sunday show at 2:00 p.m.